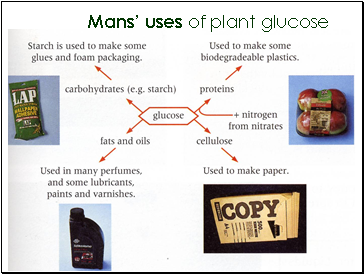 Plants make their own food, glucose, by photosynthesis. It only happens during the daytime when there is light available. 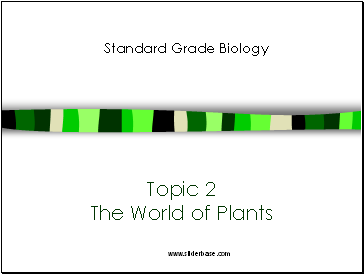 This happens in plant cells containing the chemical chlorophyll (green-coloured) which traps the light energy. 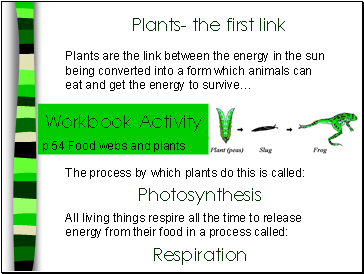 The plants have captured light energy and turned it into a store of chemical energy (glucose). 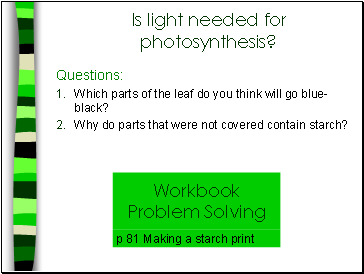 Is light needed for photosynthesis? Take a de-starched geranium plant (24h in dark). Cover part of a leaf with some tin foil (this prevents light getting through). Leave the plant in sunlight for a few hours. Enclose it in a plastic bag with a chemical that absorbs carbon dioxide. (e.g. soda lime or sodium hydroxide pellets). Leave the plant in sunlight for a couple of hours. Which parts of the leaf do you think will go blue- black? Why do parts that were not covered contain starch? 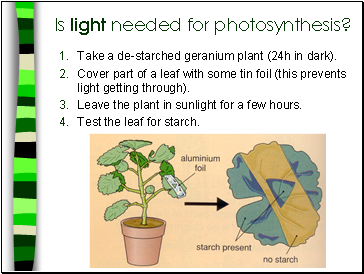 Does the leaf contain starch? Why/ why not? 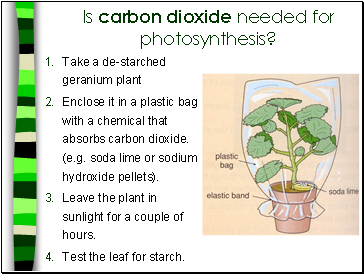 Has the plant carried out photosynthesis? 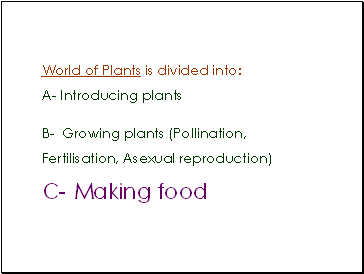 What would be your control plant’s conditions? 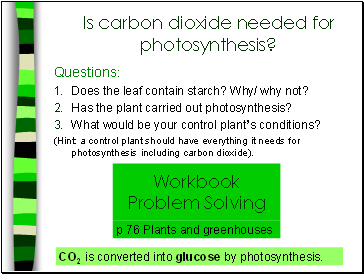 (Hint: a control plant should have everything it needs for photosynthesis including carbon dioxide). 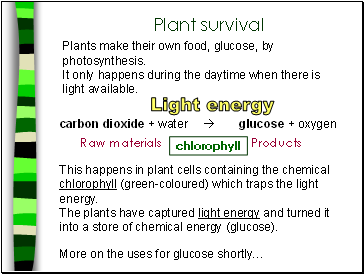 CO2 is converted into glucose by photosynthesis.